The first biochip was invented by an American company namely Affymetrix, and the product of this company is GeneChip (DNA microarrays). These products comprise the number of individual DNA sensors used for sensing defects. Biochip plays an essential role in the field of biology research like systems biology as well as disease biology while the number of clinical applications is rising. It is a set of microarrays which are placed on a strong surface of a substrate to allow thousands of reactions to be performed in less time. The development of biochip mainly includes the combination of molecular biology, biochemistry, and genetics. Biochips are used for analyzing organic molecules connected with a live organism. This article discusses what is Biochip, types, biochips and their uses, disadvantages, and its applications. A biochip is a set of diminished microarrays that are placed on a strong substrate that allows many experiments to be executed at the same time to obtain a high throughput in less time. This device contains millions of sensor elements or biosensors. Not like microchips, these are not electronic devices. Each and every biochip can be considered as a microreactor that can detect a particular analyte like an enzyme, protein, DNA, biological molecule or antibody. The main function of this chip is to perform hundreds of biological reactions in a few seconds like decoding genes (a sequence of DNA). 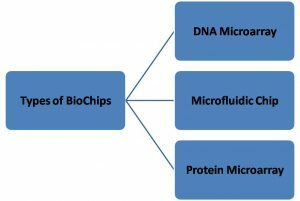 The working of Biochip mainly includes the following steps. Step4: Reader strengthens the received code to change it into digital form and finally exhibits it on LCD. The Biochip comprises two components namely the transponder as well as reader. Transponders are two types’ namely active transponder and passive transponder. This is a passive transponder which means that it doesn’t contain any of its own energy or battery whereas in passive, it is not active until the operator activates it by giving it a low electrical charge. This transponder consists of four parts such as antenna coil, computer microchip, glass capsule, and a tuning capacitor. The computer microchip stores a unique identification (UID) number that ranges from 10 digits to 15 digits long. The antenna coil is very small, primitive and this type of antenna is used to send and receive the signals from the scanner or reader. The charging of the tuning capacitor can be done with the small signal i.e, 1/1000 of a watt which is sent by the operator. The glass capsule holds the antenna coil, capacitor, and microchip, and it is made with a biocompatible material namely soda lime glass. The reader comprises of a coil namely “exciter” and it forms an electromagnetic field through radio signals. It offers the required energy (<1/1000 of a watt) to activate the biochip. The reader carries a receiving coil for receiving the ID number or transmitted code sent back from the excited implanted biochip. There are three types of Biochips available namely DNA microarray, microfluidic chip, and protein microarray. A DNA microarray or DNA biochip is a set of tiny DNA spots fixed to a strong surface. A researcher utilizes to calculate the expression levels for a large number of genes. Every DNA mark comprises picomoles of particular genes which are termed as probes. These can be a short segment of a genetic material under high rigidity situations. Usually, probe-target hybridization is noticed and counted by recognition of fluorophore or chemiluminescence labeled targets to decide the relative quantity of nucleic acid series in the target. Innovative arrays of nucleic acid were macro arrays about 9 cm X 12 cm and the initially automated icon based analysis was published in the year 1981. 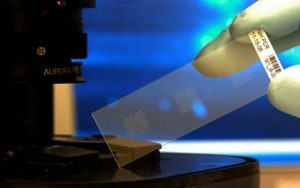 Microfluidic biochips or lab-on-a-chip are a choice to usual biochemical laboratories and are transforming several applications like DNA analysis, molecular biology procedures, proteomics which is known as the study of proteins and diagnostic of diseases (clinical pathology). These chips are becoming more complex by using 1000’s of components, but those components are designed physically called as bottom-up full-custom plan, which is a very large workforce. A protein microarray or protein chip method is used to follow the actions as well as connections of proteins, and to find out their function on a large scale. The main advantage of protein microarray is that we can track a large number of proteins in parallel. This protein chip comprises of a surface for supporting like microtitre plate or bead, nitrocellulose membrane, the glass slide. These are automated, rapid, economical, very sensitive, consumes less quantity of samples. The first methodology of protein chips was introduced in antibody microarrays of scientific publication in the year 1983. The technology behind this chip was quite easy to develop for DNA microarrays, which have turned into the most generally used microarrays. The advantages of biochip include the following. Very small in size, powerful and faster. Biochips perform thousands of biological reactions in a few seconds. The disadvantages of biochip include the following. Biochip raises dangerous problems of individual privacy. Biochip marks the end of human being liberty and self-respect. Biochips can be fixed into the human’s body without their interference. 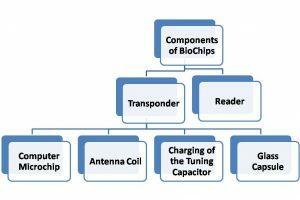 The applications of biochip include the following. By using this chip we can trace a person or animal anywhere in the world. This chip is used to store and update the information of a person like medical financial and demographics. These chips are effective in restoring the records of medical, cash, passport, etc. The biochip can be applicable in the medical field as a BP sensor, glucose detector, and oxygen sensor. From the above-discussed information finally, we can conclude that biochips are accurate, fast, and miniaturized. The biochip space lies at the intersection between chip manufacturing, molecule biology, genomics, and signal processing. The market for Biochips and its applications has been increased in a number of core research regions. Here is a question for you, what is the biochip definition?